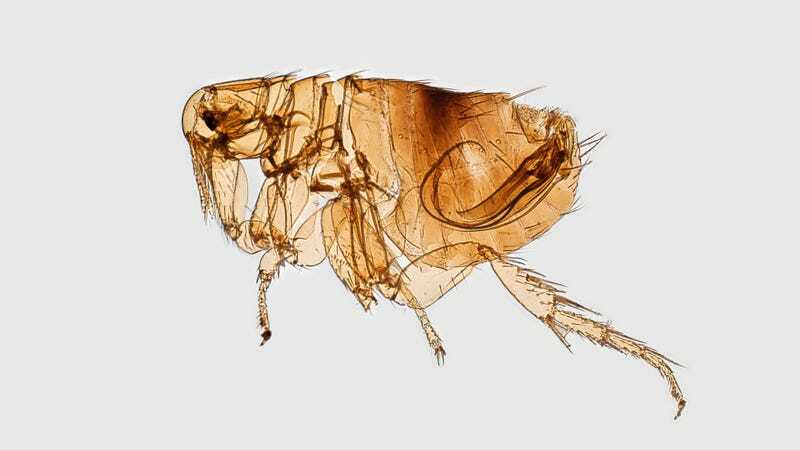 The Oriental rat flea, or Xenopsylla cheopis, can spread typhus through its poop. The city of angels is dealing with a nasty outbreak of a disease spread by fleas. Last Friday, California health officials reported that there has been an epidemic of flea-borne typhus within the Los Angeles area this year. Typhus is an old disease, with recorded accounts dating back to the 14th century. There are several forms of typhus, but all are caused by a group of bacteria known as Rickettsia. Each form is primarily spread by a different insect or arachnid vector. Like many vector-borne diseases, typhus thrives in warm and tropical areas. The most serious form of typhus—spread by body lice—has killed millions of people throughout history, but nowadays, thanks to better sanitation and living conditions, as well as the discovery of antibiotics, it’s rarely seen in most of the world. Flea-borne typhus is more common and less serious, but in the U.S., it’s still only sporadically spotted in Southern states like Texas, California, and Hawaii. One of the hotspots for typhus in California is Pasadena, a city within Los Angeles County. According to the Pasadena Public Health Department, there have been at least 20 residents who have contracted the disease this year, a relatively dramatic rise from the one to five cases seen annually. There have also been more than 20 cases outside of Pasadena in the state, according to NBC News. And because typhus most often occurs in the summer and fall months, more cases could be on the way. The symptoms of typhus include fever, headache, nausea, and rash. Less commonly, it causes neurological symptoms like seizures or confusion. Though most people recover without medical help, flea-borne typhus can be fatal, especially if more severe symptoms go untreated. Flea-borne typhus is also known as murine typhus—a reference to the fact that rats are the main host of the fleas that can spread the bacteria, Rickettsia typhi. But fleas that feed from pets and other feral animals like opossums can also spread it. These animals can put us in close contact with the fleas, who aren’t shy enough to turn down an opportune meal from people. We don’t get typhus from the flea’s bite, though. The fleas poop out the germ, which then gets into our system when it’s rubbed into skin wounds or our eyes. Health officials are still trying to figure out why typhus has been so common this year, though an especially warm year has likely contributed to the increase. The seeming rise of homelessness in areas like downtown Los Angeles might also explain some cases. Both poverty and climate change, experts in vector-borne disease have warned, are sure to make diseases like typhus once again common throughout the U.S.